"Hollywood's hottest couple just split up. It'll take more than special effects to reunite them." 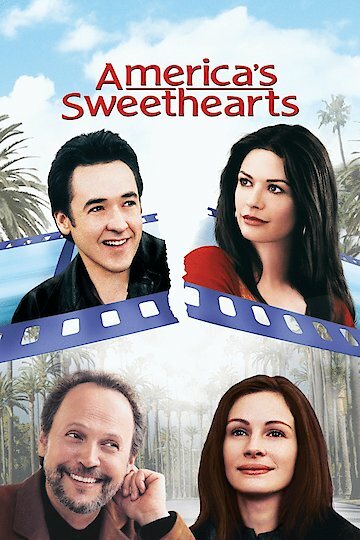 In this romantic comedy, Eddie (John Cusack) and Gwen (Catherine Zeta-Jones) are married actors known as “America's Sweethearts” but now are undergoing an ugly separation. Their new film is about ready to be released but the movie’s crazy director will not show the publicist (Billy Crystal) a cut of the film. So the publicist decides in order to successfully promote the film he needs to reunite the couple. Eddie and Gwen are both pressured to attend a press junket to promote the film together. Gwen’s personal assistant and sister Kiki (Julia Roberts) is the go between for her communication with Eddie. Eddie is suddenly attracted to Kiki after not seeing her for a while. Eddie sees how Gwen is controlling of Kiki and begins to fall in love with her. When the film is finally shown to the press and cast it's surprisingly a reality movie made without the actors' knowledge. The movie shows how self-centered and manipulative Gwen is in real life and how Eddie is a good man who suspects his wife is cheating on him. Somehow Kiki is finally able to stand up to Gwen and reveals some secrets from her past. America's Sweethearts is currently available to watch and stream, buy, rent on demand at FlixFling VOD, Amazon, Vudu, Google Play, FandangoNow, iTunes, YouTube VOD online.